With an eye-catching design and sealed water tank to insure proper hygiene, the Breeze will thrill event coordinators who truly want both. It has two stations with full fingertip to elbow washing and operates with hands-free baby foot pumps that have been standard in Satellite products for many years, providing care-free operation. The new Breeze comes with features operators said they want in a handwash station. To maintain its attractiveness the blue areas have a fleck pattern to hide scuffs and scratches. It also has extended bumpers on the side and top to buffer it while traveling. There are fresh and grey water drain plugs and an additional pump out port on the base for waste water. To aid drivers, all plugs are tethered to the unit to prevent loss or damage. It has two handles for lifting and fits easily inside most portables for ease of transporting. Most of all, it has a sealed fresh water tank where chlorine can be added to kill bacteria. All in all, it is a breeze to maintain and operate. 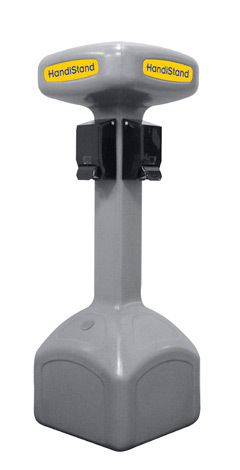 The low-cost HandiStand will pay for itself in half the time and cost less to maintain than most other hand sanitation stands. The HandiStand is made from unbreakable molded polyethylene that can withstand the force of vandals and nature so you can keep renting it year after year. 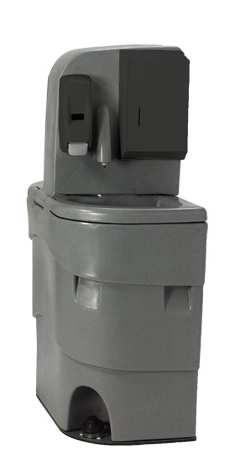 If faster profits and long term benefits are what you want from a hand sanitation stand, then Handistand will deliver. The redesigned Wave has even more to offer with its sealed fresh water tank for added hygiene. The sealed tank allows for the use of chlorine tablets to kill harmful bacteria that may be living in the water, helping protect the user and the public from harm.